Lake sturgeon are members of a family of fish that has existed since the Upper Cretaceous period 136 million years ago. They can grow up to 7 feet long and weigh over 200 pounds, with a typical lifespan of 55 years for males and up to 100 years for females. Lake sturgeon can grow to weights of up to 200 pounds and lengths of 7 feet. Lake sturgeon are benthivores; they feed on small invertebrates such as insect larvae, crayfish, snails, clams and leeches along the bottom of lakes and rivers. An adult sturgeon may swim throughout the Great Lakes, but habitually return to spawn in the stream where it was born. Females spawn for the first time at about 25 years; males may take up to 22 years. Fishing regulations establish the season, number and size of fish caught to protect each species and ensure its long-term survival. Fisheries biologists regularly study Michigan waters to check on fish numbers and the health of the population. Money gathered from fishing and hunting license fees help pay for wildlife conservation, protecting species such as the lake sturgeon. With their large suction mouth, shark-like tail, and rows of bony plates up and down its 6-foot-long body, lake sturgeon are pretty intimidating. But not to 12-year-old Elena Guc. “I think it’s really interesting how lake sturgeon have been around since dinosaur times and how their different features help them survive and live to be 100 years old,” Guc said. That’s why the girl happily travels to fairs and festivals across metro Detroit explaining the importance of Michigan’s largest and longest-living fish species – and how we all can play a part in saving this ancient fish. “That means if I could catch and release a lake sturgeon today, it could easily survive for my grandchildren to catch again, long after I’m gone,” said Mike Thomas, a retired DNR fisheries research biologist and sturgeon fishing enthusiast. Once ranging throughout the Great Lakes, lake sturgeon were so abundant that many rivers and streams were literally packed with spawning runs. But commercial fishing and the destruction of spawning grounds nearly wiped out the entire population by the early 1900s. “Now they are rare enough that many Michigan fishermen can fish their whole lives without ever encountering one of these gentle giants,” Thomas said. Lake sturgeon remain on the state of Michigan’s threatened species list. But the fish are on the rebound thanks to extensive conservation and management efforts by the state Department of Natural Resources (DNR), U.S. Fish & Wildlife Service, tribal governments, and Michigan sportsmen and sportswomen. 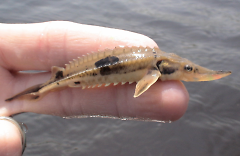 Today there are approximately 50,000 adult sturgeon in Michigan waters, with half of those living in the St. Clair–Detroit River corridor according to Dave Caroffino, a DNR biologist and chairman of the Lake Sturgeon Committee for the DNR Fisheries Division. Unlike many fish, sturgeon mature very slowly and seldom spawn before they’re 20 years old. Females spawn only once every three to five years. That’s why federal and state fisheries experts say improving spawning habitat and fish stocking are key in rehabilitating sturgeon. “Lake sturgeon live in the Great Lakes and swim upriver to spawn. After hatching, juvenile sturgeon stay in the river for their first summer of life. So quality river habitat is very important to them,” Caroffino said. Much of their natural spawning ground, however, has been blocked off in the last century by dams. “Dams have fragmented habitat, they’ve reduced the quality of habitat, and they’ve reduced the quantity of habitat available,” Caroffino said. To offset that obstacle, the DNR has worked diligently to improve downstream rivers and tributaries to make them more appropriate for spawning sturgeon. In Southeast Michigan, the creation of several artificial spawning reefs on the St. Clair River has assisted sturgeon to “self-sustain” their own population. But in the rest of the state, additional management is needed. Streamside hatchery and production facilities have proved to be successful. Eggs are collected, fertilized and raised in tanks filled with the nearby stream water. This allows the young fish to remember that waterway – a process called imprinting – so they will return many years later to spawn. The DNR operates streamside hatcheries on the Black River in northeast Michigan and on three rivers in the Upper Peninsula: the Ontonagon, Cedar and Whitefish rivers. Similar facilities are operated on the Kalamazoo River by the U.S. Fish & Wildlife Service, and on the Manistee River by the Little River Band of Ottawa Indians. While it is widely known that wildlife is a renewable natural resource, some people may not be aware that all hunters and anglers play an important role in keeping wildlife populations at a healthy balance for the habitat through regulated hunting and fishing. Across most of the state, any sturgeon caught must be released immediately. The exceptions are on Lake St. Clair, the St. Clair River, Otsego Lake, Black Lake, the Menominee River and the Boundary Waters, where the fish’s population is higher. However, the annual harvest is limited. “Not only do hunting and fishing license fees pay for species conservation and wildlife reintroduction programs, but they also are used to stock lakes and manage Michigan’s beautiful forests, lands and river quality,” said Carol Rose of the Michigan Wildlife Council. The Michigan Wildlife Council was established three years ago to educate the public about the importance of wildlife conservation. It’s now in the midst of a campaign to increase non-sportsmen’s knowledge about how wildlife and Michigan’s outdoors are managed and funded, and the role sportsmen and sportswomen play in preserving Michigan’s great outdoor heritage for future generations. It’s hard to appreciate a fish that you’ve never seen. Because sturgeon are bottom dwellers, they rarely surface from the depths of the Great Lakes except during spawning season. That’s why educating the general public about the plight of lake sturgeon is also vital to the fish’s rehabilitation. Sturgeon for Tomorrow is a nonprofit organization dedicated to the future of lake sturgeon. With Michigan chapters in Mt. Clemens, Black Lake and Kalamazoo, the group assists DNR fisheries managers in the rehabilitation of lake sturgeon and advances education about the fish. Since 2013, the organization has operated Sturgeon in the Classroom programs in their respective regions, including four schools in Metro Detroit. Each classroom adopts a fall fingerling lake sturgeon that’s been raised at the streamside hatchery on the Black River. Students nurture their sturgeon with feeding regimens, proper water temperature, and tank maintenance throughout the school year, while also learning about threatened and endangered species and the importance of stewardship. At the end of the school year, the fish are released back into the Black River. “Even though the fish are raised in Detroit, they’ve been imprinted in that Black River water. So 25 years from now when they are ready to spawn, they’ll come back to that very same spot. It’s really amazing,” said Jim Felgenauer, president of the St. Clair-Detroit River Sturgeon for Tomorrow. Felgenauer said that with DNR permits, he and other Sturgeon for Tomorrow volunteers also keep fingerlings in 25-gallon tanks and take them to regional fairs and festivals so folks can see this relic fish in person. Seventh-grader Elena Guc grew up fishing for walleye and perch with her family on the St. Clair River and Lake St. Clair. She says she learned about sturgeon from her dad, Steve, and her uncle, Jeremy Guc, who are members of Sturgeon for Tomorrow. 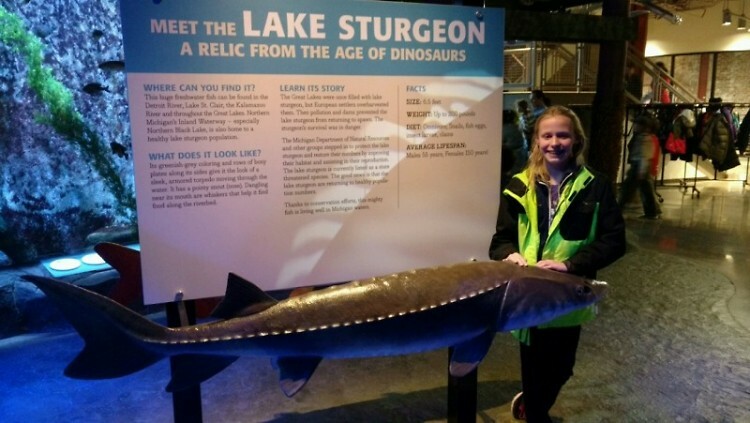 So when she has a chance to help spread the word about the fish at a festival or fair, she’s excited to ride along as the group’s unofficial sturgeon ambassador. Elena, who wants to someday work as a doctor or biomedical engineer, says she likes helping out. “I want everyone to know about this really cool fish that’s been around since the time of dinosaurs. But I also want them to know how to protect them from extinction,” she said.